Imagine sitting on a covered porch, listening to the sounds of rain tapping on the roof and a chorus of frogs and crickets in the lush vegetation surrounding you. This may sound like a tropical vacation but, in fact, can be found right here in a Raleigh backyard. A tropical paradise is what we helped create for one local family who wanted to add outdoor living spaces to their home that took advantage of their beautiful landscape. To achieve our client’s goals, we designed and built three new outdoor spaces for them to enjoy: a pressure-treated wood deck, back porch, and side porch. Each space was designed to complement their home in a tropical style with coordinating design details. The porch and side entry feature matching vertical white rails that mirror what exists on their front porch. The open gable and exposed rafters of the porch roof are foundational to achieving that airy tropical feeling. And not one detail was missed as we added tongue-and-groove flooring on the porch, riser lights in the flared steps, copper post caps at the top of the stairs, and a ceiling fan to keep the hot summer air flowing. We were especially pleased that we could honor the homeowner’s request and build around the tree that hangs over the porch roof. Their beloved tree is still in place to be enjoyed along with their new outdoor living spaces. 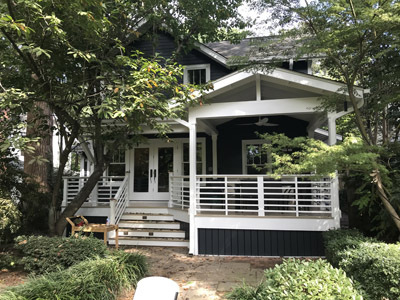 Enjoy the gallery below to see all the details of this lovely Raleigh back porch addition.